I agree, for removing the passenger pegs, this is a must. Did this mod to my 06 1000RR, cleaned up the tail for sure. Doing the same mod to my Z1000. Cut to the appropriate length & zip tie, no burnt hose. Advantages: Cleans up the tail for a slim look. Do not get this if you own a 2004-2007 CBR1000RR. I got this for my 2005 and found that the proximity of this tube to the exhaust results in the tube melting. 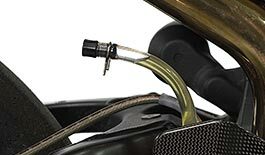 It was actually melting at the connection to the master cylinder. This tells me that the material the tube is made out of does not have equivalent heat resistance as the stock tube. I gave this a 3 star only because for other bikes it probably is sufficiently far from the exhaust that it will work and look cool. It is a zero star for the bike model that I have for obvious reasons. The placement of the reservoir delete solely depends on the users ability to cut the tube to the appropriate length. We use Tygon tubing which is used universally for many applications in the brake component industry and can withstand temperatures of up to 130° F.
Advantages: Looks good. Until it melts and goes bye-bye.